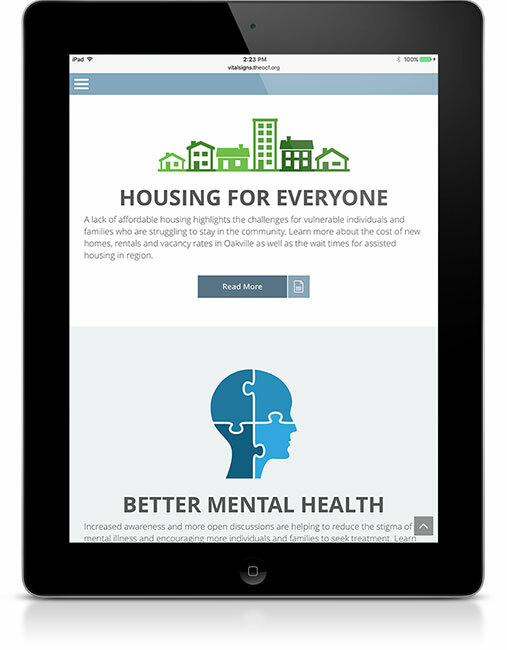 Oakville Community Foundation 2015 Vital Signs Report | circus strategic communications inc. The Oakville Community Foundation (OCF) is a registered charity and one of the largest members of a national network of over 190 Canadian community foundations. The OCF’s role is to act as a conduit, connecting donors with charities and community issues that matter most to them – either through donation to an OCF-directed general community fund or by becoming a Fundholder and directing funds to their own charities of choice. As part of the national community foundation organization, the OCF publishes the Vital Signs Report to highlight the areas of greatest need within their local community. 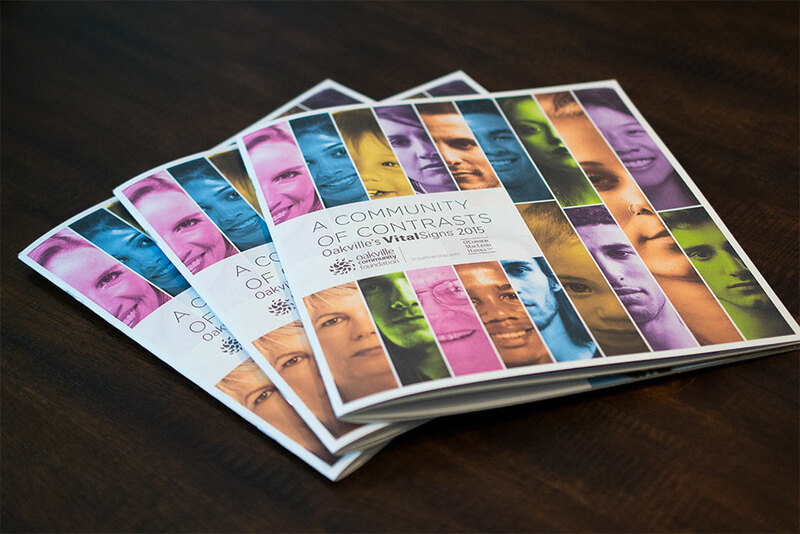 Creatively, the 2015 Oakville Vital Signs Report leveraged images of individuals to represent the people in need in the community. The isolating colour bars used on the front cover were echoed on the report’s interior by using a single colour for each issue page spread. 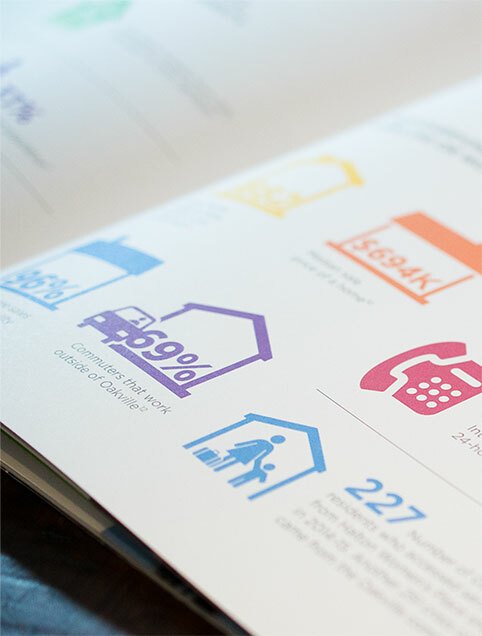 Large images of individuals combined with engaging infographics and clear, succinct content make the report an approachable resource for everyone in Oakville. This snapshot of Oakville has created an important foundation for the OCF’s next steps in addressing these identified areas of need. 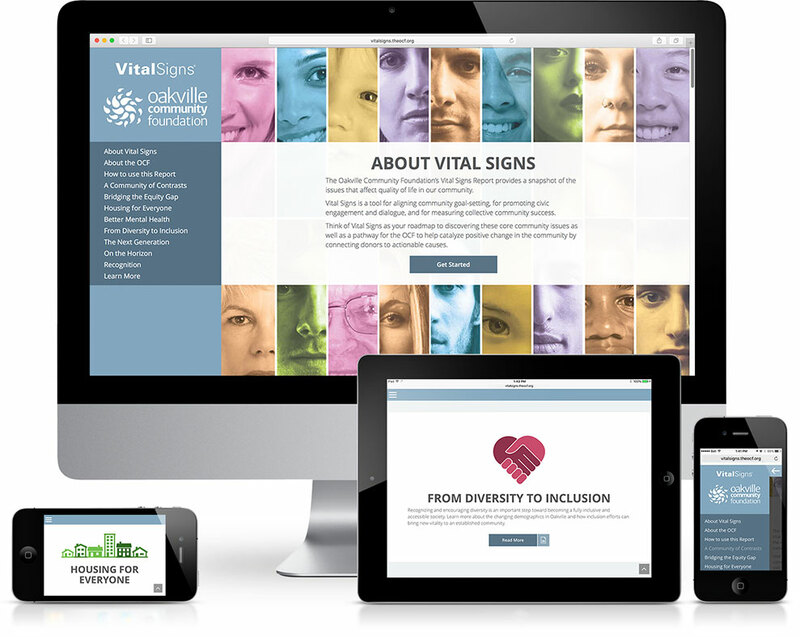 Subsequent Vital Signs Updates will evolve the overall look to include collaborative group images and images demonstrating hope to communicate the change that is occurring in the community rather than the isolated individuals of the initial report. The 2015 Vital Signs Report was the first step toward raising awareness of the Oakville community’s needs and resources. The quality and clarity of this report served as the basis for a recent visit from the Governor General to speak at an OCF event earlier in 2016, focused on Smart & Caring communities, as well as a way to connect needs with resources so that the community can find out how they can learn more, do more and give more. Once the report was released to the public, circus also designed and launched Vital Signs 2.0 – a microsite used to identify the original issues covered in the report, and update the community on where The Foundation is headed in the future.